Figure. Adjusted odds ratios for intensive care unit (ICU) admission within 2 hours of medical emergency team (MET) activation, change in patient goals of care, and hospital mortality according to ICU bed availability. Vertical lines indicate 95% CIs. Deferred Admission to the Intensive Care Unit: Rationing Critical Care or Expediting Care Transitions? Background Intensive care unit (ICU) beds, a scarce resource, may require prioritization of admissions when demand exceeds supply. We evaluated the effect of ICU bed availability on processes and outcomes of care for hospitalized patients with sudden clinical deterioration. Methods We identified consecutive hospitalized adults in Calgary, Alberta, Canada, with sudden clinical deterioration triggering medical emergency team activation between January 1, 2007, and December 31, 2009. We compared ICU admission rates (within 2 hours of medical emergency team activation), patient goals of care (resuscitative, medical, and comfort), and hospital mortality according to the number of ICU beds available (0, 1, 2, or >2), adjusting for patient, physician, and hospital characteristics (using data from clinical and administrative databases). Results The cohort consisted of 3494 patients. Reduced ICU bed availability was associated with a decreased likelihood of patient admission within 2 hours of medical emergency team activation (P = .03) and with an increased likelihood of change in patient goals of care (P < .01). Patients with sudden clinical deterioration when zero ICU beds were available were 33.0% (95% CI, −5.1% to 57.3%) less likely to be admitted to the ICU and 89.6% (95% CI, 24.9% to 188.0%) more likely to have their goals of care changed compared with when more than 2 ICU beds were available. Hospital mortality did not vary significantly by ICU bed availability (P = .82). Conclusion Among hospitalized patients with sudden clinical deterioration, we noted a significant association between the number of ICU beds available and ICU admission and patient goals of care but not hospital mortality. 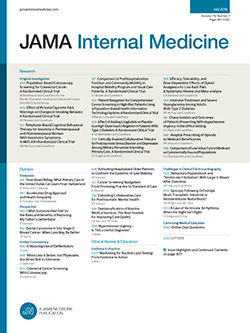 Physicians routinely make decisions in the setting of resource constraints, despite limited training in resource allocation.5,8 Available evidence suggests that notions of equity often guide physician care9,10 and that patients who are perceived to be unlikely to benefit from critical care are more often declined ICU admission.5 Although the tenets of biomedical ethics and international law indicate that protocols should be used to guide resource allocation when demand for ICU resources exceeds supply,11,12 formal triage protocols are not routinely part of rapid response systems or decision making surrounding patient ICU admission.8 For these reasons, we undertook a study to examine the association between ICU bed availability (0, 1, 2, or >2 beds) and the processes and outcomes of care for a population-based cohort of hospitalized patients with sudden clinical deterioration. We identified consecutive hospitalized adults (excluding cardiac surgery and coronary care units) in Calgary, Alberta, Canada (with a 1.5-million catchment population) having sudden clinical deterioration identified by the rapid response system and triggering medical emergency team (MET) activation between January 1, 2007, and December 31, 2009. A rapid response system is a hospital-based capability to detect patients with sudden clinical deterioration and mechanism to quickly respond to patients' needs, while a MET is a group of clinicians activated by the rapid response system.4 Alberta Health Services manages all METs (each composed of 1 ICU physician, nurse, and respiratory therapist 24 h/d and 7 d/wk) and medical-surgical (general system) ICUs (53 funded beds) in Calgary (3 hospitals, with a total of 2040 beds, each with a MET and an ICU). The ICUs are closed units staffed by fully trained intensivists. To trigger MET activation, the Alberta Health Services rapid response system used the following physiologically based criteria13: (1) respiratory (threatened airway, respiratory rate of <8 or >30 breaths/min, or acute change in oxygen saturation of <90%, despite oxygen >5 L/min), (2) heart rate (pulse rate of <40 or >140 beats/min), (3) blood pressure (systolic blood pressure of <90 mm Hg), (4) neurological (sudden decrease in Glasgow Coma Scale score of ≥2 points or prolonged or repeated seizures), and (5) worried (“any patient that you are seriously worried about”). Decisions to admit patients to the ICU are made by the attending physician on a case-by-case basis, without a triage protocol or decision-making support. Hospital wards activating the MET are not generally aware of ICU bed availability. The primary outcome was ICU admission within 2 hours of MET activation,21 identified using the MET and ICU databases. We chose ICU admission within 2 hours because local policy is to decide on patient disposition within 30 minutes of MET arrival. An additional 90 minutes was provided to enable ICU transfer. We examined the following 4 secondary outcome measures: (1) change in patient goals of care (resuscitative, medical, or comfort) within 24 hours of MET activation; (2) hospital mortality; (3) health care resource use, evaluated by investigations and interventions performed during the initial MET activation or a new MET activation (including the use of cardiopulmonary resuscitation); and (4) ICU admission during the remainder of the hospitalization (ie, >2 hours following the initial MET activation). The primary analysis tested associations between the number of ICU beds available (0, 1, 2, or >2) and ICU admission within 2 hours of MET activation using a generalized estimating equations model. The unit of analysis was the initial MET activation during the hospitalization (subsequent MET activations were evaluated as an outcome). We selected a generalized estimating equations model because it is an extension of standard logistic regression analysis that adjusts for correlation among observations (ie, patients with >1 hospitalization having a MET activation during the study period or patients clustered within hospitals)22,23 and provides population average effect (average response for observations sharing the same covariates), which has familiar interpretation and is more useful when estimating effects at a population level.24,25 We adjusted for patient, physician, and hospital covariates (all baseline variables measured) when analyzing outcome measures. Health care resource use was tested across the 4 defined levels of ICU bed availability using Pearson product moment correlation χ2 test for differences in proportions and Kruskal-Wallis test for differences in medians. Sensitivity analyses were performed to explore the effect on the primary outcome of study hospital, time of MET activation, physician attending MET activation, and patient goals of care. Statistical analyses were performed using commercially available software (SAS version 9.2; SAS Institute, Inc), and 2-sided P < .05 was considered significant. The Conjoint Health Research Ethics Board at the University of Calgary approved this study and waived the need for informed consent from patients and physicians. The cohort consisted of 3494 patients (3.2 patients per day with sudden clinical deterioration and MET activation). The median age was 72 years (interquartile range [IQR], 57-81 years), 46.8% were female, 46.2% had 1 or more comorbidities, and 10.3% had a prior ICU admission during their hospital stay. Fewer MET activations occurred when zero ICU beds (249 [7.1%]) or 1 ICU bed (470 [13.5%]) was available. Patient characteristics by ICU bed availability were similar, with a few notable exceptions (Table 1). MET activations at night and for respiratory reasons were more common when more ICU beds were available. Residents were more likely to be the physician attending MET activation when fewer ICU beds were available. We examined MET processes of care according to the number of ICU beds available (Table 2). Although the duration of MET activations was similar across groups (median, 53 minutes; IQR, 33-80 minutes), there were significant positive associations between the number of ICU beds available and the use of investigations and interventions. Patients were more likely to have arterial blood gases measured and radiographs obtained of the chest or abdomen when more ICU beds were available (P < .01 for both). Noninvasive airway interventions, including airway suctioning (P < .01), oxygen (P = .08), and nebulized medications (P = .05), were more frequently provided when more ICU beds were available. In total during MET activations, 4.4% of patients were intubated and mechanically ventilated when zero ICU beds were available and 10.1% of patients when more than 2 ICU beds were available (P < .01). Multivariable-adjusted analyses of patient outcomes of care are summarized in the Figure, Table 3, and Table 4. Hospitalized patients with sudden clinical deterioration were significantly more likely to be admitted to the ICU within 2 hours of MET activation when more ICU beds were available (P = .03) (Table 3). In total, 11.6% of patients evaluated by the MET when zero ICU beds were available and 21.4% of patients when more than 2 ICU beds were available were admitted to the ICU within 2 hours of MET activation. Among patients not admitted to the ICU within 2 hours of MET activation, subsequent ICU admissions were infrequent in all 4 groups (eTable). Few patients in all 4 groups (411 [11.8%]) experienced cardiac arrest or new MET activation following the initial patient MET activation. Length of ICU stay for patients admitted to the ICU within 2 hours of MET activation (median, 4 days; IQR, 2-8 days) and length of hospital stay after MET activation for patients discharged alive (median, 15 days; IQR, 7-35 days) were similar across the groups. More patients had their goals of care changed from resuscitative care to medical or comfort care when zero ICU beds were available (37 [14.9%]) compared with when 2 or more ICU beds were available (174 [8.5%]) (P < .01). Hospital mortality was similar across the 4 patients groups (P = .82), ranging from 32.1% to 34.7%. The number of ICU beds available was associated with the likelihood of ICU admission within 2 hours of MET activation and with change in patient goals of care (Table 4 and Figure). Compared with when more than 2 ICU beds were available, ICU admission was 33.0% (95% CI, −5.1% to 57.3%) less likely when zero ICU beds were available and 32.4% (95% CI, 7.3% to 50.7%) less likely when 1 ICU bed was available. Conversely, change in patient goals of care from resuscitative care to medical or comfort care was 89.6% (95% CI, 24.9%-188.0%) more likely when zero ICU beds were available and 61.8% (95% CI, 15.5%-126.6%) more likely when 1 ICU bed was available. The adjusted odds ratios for hospital mortality were not significantly different across the 4 groups, although the 95% CI when zero ICU beds were available included a 25.6% increase in hospital mortality. Results were similar when analyses were stratified according to study hospital, time of MET activation, and physician attending MET activation or when restricted to patients with resuscitative goals of care at the time of MET activation. In this population-based cohort study, we found a strong association between the number of ICU beds available and processes of care for hospitalized patients with sudden clinical deterioration. We noted a lower probability of patient ICU admission and a higher probability of change in patient goals of care from resuscitative care to medical or comfort care as the number of ICU beds available decreased. Hospital mortality was similar for patients regardless of the number of ICU beds available. This suggests that, for hospitalized patients with sudden clinical deterioration, the number of ICU beds available at the time of their deterioration affects processes of care but may not influence hospital mortality. Our study provides important information on how ICU bed availability can affect processes of care for hospitalized patients with sudden clinical deterioration. Results of previous studies5,26-30 have demonstrated that as hospitals close ICU beds, patients admitted to the ICU are sicker, are less likely to be admitted for monitoring, and have shorter stays but with no adverse effects. Patient age, illness severity, and medical diagnosis were noted to be associated with decisions not to admit patients to the ICU.5,31-35 Our study adds to the literature in several ways. First, we demonstrate that the decision to admit a hospitalized patient with sudden clinical deterioration to the ICU is influenced by the number of ICU beds available. Second, rationing of ICU beds is a routine occurrence. We found that during a 3-year period, there was no ICU bed available at the time of MET activation for 7.1% of patients with sudden clinical deterioration. This is equivalent to 1 or 2 patients per week experiencing sudden clinical deterioration at a time when no ICU beds are available. Third, the decision to admit a hospitalized patient with sudden clinical deterioration to the ICU is complex and is influenced by patient, physician, and hospital factors. For example, our results suggest that ICU admission may be influenced by the type of physician attending MET activation (ICU attending, trainee, or ICU physician extender), despite ICU attending medical oversight of the rapid response system. Fourth, with limited training in resource allocation, it is unclear how effective physicians are at identifying patients who are most likely to benefit from ICU admission. In our study, there was no difference in hospital mortality among patients with MET activation according to the availability of ICU beds. Furthermore, among those patients who were not admitted to ICU, the risk of new MET activation and subsequent ICU admission was similar. These results suggest that available resources may have been efficiently allocated to meet patient needs. Conversely, findings from other studies36-38 have suggested that prognostication for critically ill patients is difficult and that physicians can be overconfident in their ability to identify patients with poor prognoses who are unlikely to benefit from ICU care. In summary, for hospitalized patients, the number of ICU beds available at the time of sudden clinical deterioration affects processes of care. As the number of available ICU beds decreases, patients are less likely to be admitted to the ICU and are more likely to have their goals of care changed, although this does not seem to be associated with hospital mortality. This suggests that the development of validated ICU admission and discharge guidelines might improve hospital efficiency, without affecting outcomes. Correspondence: Henry T. Stelfox, MD, PhD, FRCPC, Department of Critical Care Medicine, University of Calgary, Teaching, Research and Wellness Building, 3280 Hospital Dr NW, Calgary, AB T2N 4Z6, Canada (tstelfox@ucalgary.ca). Author Contributions: Dr Stelfox and Mr Gao had full access to all the data in the study and take responsibility for the integrity of the data and the accuracy of the data analysis. Study concept and design: Stelfox, Hemmelgarn, Bagshaw, Doig, Nijssen-Jordan, and Manns. Acquisition of data: Stelfox, Bagshaw, and Doig. Analysis and interpretation of data: Stelfox, Hemmelgarn, Bagshaw, Gao, Nijssen-Jordan, and Manns. Drafting of the manuscript: Stelfox, Hemmelgarn, Gao, and Nijssen-Jordan. Critical revision of the manuscript for important intellectual content: Stelfox, Hemmelgarn, Bagshaw, Doig, Nijssen-Jordan, and Manns. Statistical analysis: Bagshaw and Gao. Obtained funding: Stelfox, Hemmelgarn, Doig, and Manns. Administrative, technical, and material support: Stelfox, Bagshaw, Doig, and Nijssen-Jordan. Funding/Support: This project was supported by operating grant H1N-104065 from the Canadian Institutes of Health Research. Dr Stelfox is supported by a New Investigator Award from the Canadian Institutes of Health Research. Drs Stelfox and Hemmelgarn are supported by Population Health Investigator awards from Alberta Innovates. Dr Bagshaw is supported by a Clinical Investigator Award from Alberta Innovates. Dr Manns is supported by a Scholar Award from Alberta Innovates. Additional Contributions: David Megran, MD, gave comments on early versions of the article, and Alberta Health Services provided access to clinical and administrative databases.